To strengthen working relationships with Arizona’s 22 Native American Indian tribes – tribes that are key stakeholders in the state’s highway system – the Arizona Department of Transportation plans to host a series of forums to share ideas and provide information on agency resources. Offered in partnership with the Inter Tribal Council of Arizona, the Arizona DOT said its Tribal Transportation Working Group connects agency representatives with transportation officials and other representatives from tribes on matters ranging from enforcement of weight restrictions on state highways to sharing information from industry conferences. The working group has a format similar to one the Arizona DOT uses with local councils of government around Arizona, providing a single forum for all to exchange ideas rather than having sessions with individual tribes, added Ermalinda Gene, the agency’s planning program manager and a tribal liaison. “Meeting as a group brings the tribes the same consistent message and the latest news in transportation,” she said. At the group’s first meeting in February, the Arizona DOT said its representatives provided a summary of the Arizona Rural Transportation Summit held in the fall and had Enforcement and Compliance Division officers explain mobile checkpoints that make sure large trucks obey laws on proper permits and allowable weight. Maria Dadgar, executive director of the Inter Tribal Council of Arizona, noted that bringing together transportation experts and leaders from the tribes to meet regularly with the Arizona DOT helps all involved quickly identify and respond to opportunities. “Through the Tribal Transportation Working Group, tribal representatives have direct input to voice concerns and to work cohesively with [the agency] to develop positive outcomes toward improving transportation for all,” she pointed out. 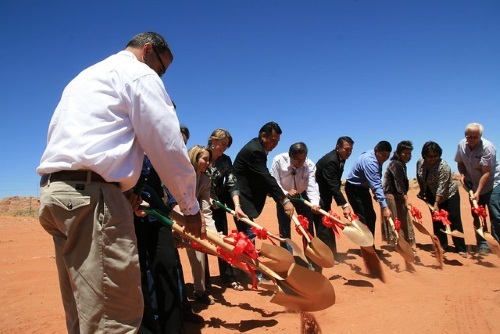 The Arizona DOT’s effort to develop deeper transportation ties with Native American tribes is reflective of a broader trend occurring in the state DOT community. During a panel discussion held January 16 held during the 2019 Transportation Research Board’s annual meeting in Washington, D.C., managers from the Oklahoma Department of Transportation and Alaska Department of Transportation & Public Facilities discussed how they are forging closer ties with tribal governments, especially since their communities tend to have a large number of members who don’t own cars, so they have more pedestrian and transit needs, explained Rhonda Fair, director of tribal coordination for the Oklahoma DOT. A similar outreach effort is occurring at the federal level. In October 2018, the Federal Highway Administration published a 22-page Notice of Funding Opportunity in the Federal Register to make $300 million available through its Nationally Significant Federal Lands and Tribal Projects or NSFLTP program – with this funding being made available “for the first time” to build and repair roads and bridges that serve tribal or federal lands.